You want 1-of-a-kind, well, HERE IT IS! This more than rare Box Office Poster was issued exclusively FOLDED to insider film industry people back in mid 1980, shortly after the release of The Empire Strikes Back. This IMPOSSIBLE to find ROLLED NEVER-FOLDED printer's proof example was saved by a printshop worker. I obtained it directly from him back in 1980. You WON'T find another rolled one of these ANYWHERE! It's a great artifact from the days when Star Wars was first making cinema history. Needless to say, if you're serious - YOU MUST HAVE THIS ONE! THIS IS 100% GUARANTEED ORIGINAL RARE 1980 PRINTING. This fantastic rarity is in unheard of NearMINT ROLLED NEVER-FOLDED CONDITION!! If you're looking for a clean one, and who's not, this would be it! It was protected in a tube since 1980 and has recently been Archivally Museum Linen-mounted to flatten it out and protect it from damage, so it can be framed properly. It worked like a charm because the poster came out terrific! I used the best conservator in the USA. He ONLY uses high-grade materials, such as thicker linen and thicker acid-free Japanese rice paper. The better materials cost more but make a real difference in the end result. It's flat as a pancake and as nice as can be. A finer Star Wars poster display would be hard to get, maybe impossible. This poster is class all the way! Let's face it, if you've looked - then you've learned - this poster is IMPOSSIBLE to find in clean ROLLED NEVER-FOLDED condition!! Is an accepted form of poster preservation by the Library of Congress and every Museum in the country. A lot of advanced poster buyers request and prefer linen-mounted posters because it makes framing and displaying the posters much easier - without the risk of damaging the original. The white you see in the photo - beyond that of the poster - is the white of the Japanese paper lining the linen border margin. You can see how easy it would be to damage the original poster without that extra margin of protection. The backing makes the poster much safer to handle - it GREATLY reduces the risk of damaging the original. Also, all of my linen-backed posters have been stored FLAT so they DO NOT have a curl to them - They're all ready for framing and display! If you're looking for an investment/museum quality item. Princess Leia Organa Peter Cushing.... Grand Moff Tarkin Alec Guinness.... Ben Obi-Wan Kenobi Anthony Daniels.... Darth Vader James Earl Jones.... It can crash regardless of any decision you make and can even crash regardless of any decision made by the company related to the stock - Leaving you with a near worthless piece of paper that won't inspire anyone! The magnificence of art and historic documents have an inherent value that relates to civilization and society. Please write with any questions. If you're in the market for top quality original vintage movie posters or Star Wars, then please. 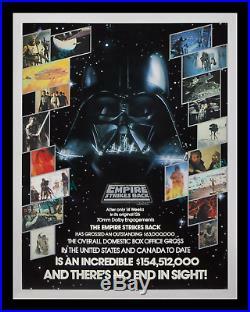 The item "Star Wars THE EMPIRE STRIKES BACK 1-OF-A-KIND BOX OFFICE MOVIE POSTER PROOF" is in sale since Thursday, July 19, 2018. This item is in the category "Entertainment Memorabilia\Movie Memorabilia\Posters\Originals-United States\1980-89".miniver" and is located in Studio City, California. This item can be shipped worldwide.